Four business men and women are having a break duting a meeting and they're smiling while taking selfies. Happiness is no longer the ultimate goal of life. Whether you agree or disagree one way to make a profit is to create a business that will flourish. Economists taught us that the goal of capitalism is to create wealth and, in turn, wealth creates more wealth. Then along came the psychologists who taught us that when you have made enough wealth you should be happy. How much is enough? When you are wealthy and happy what next? For your business, making profit and enjoying your work are important, but why not make your business flourish by following a new path to well-being. Now ask yourself as a business leader: How many of these features do I have right now, and how many can I find in my business? If the answer is none then you have a lot of work to do! If the answer is some then how can you increase them and focus on the ones that need the most effort. 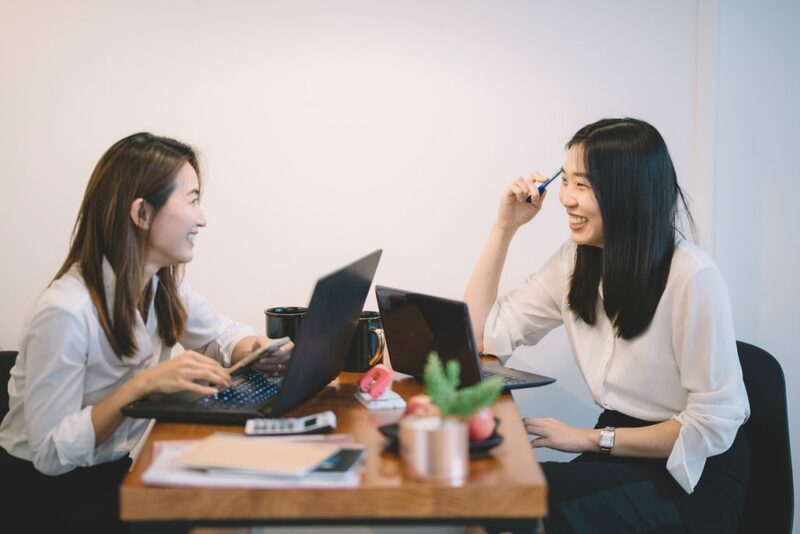 One recent study of SMEs in Thailand found that, overall, the level of happiness of SME employees in Chiang Mai is high. Three factors contributed to this; relationships, quality of working life, and leadership. 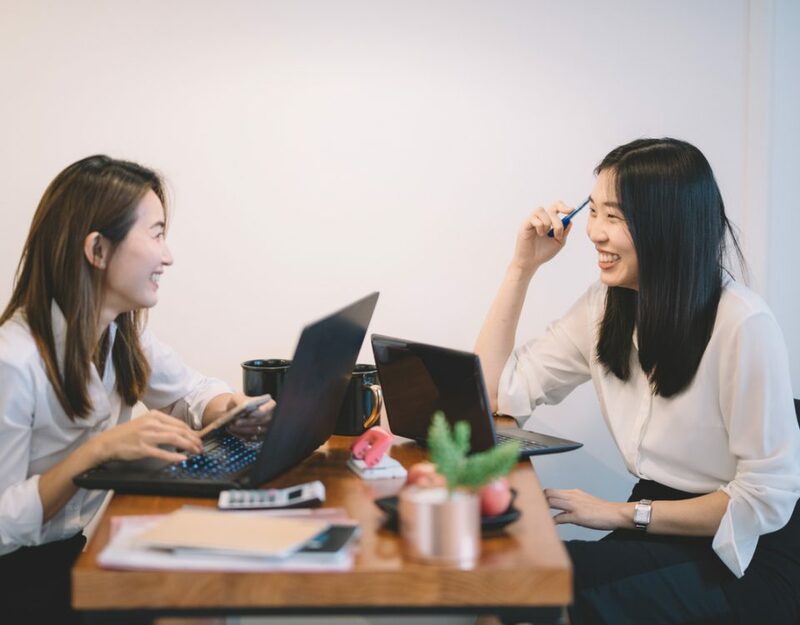 SMEs should improve on these factors to increase happiness levels with good relationships resulting in good communication, altruism amongst employees, and unity. Good business leaders show fairness and create a friendly work environment including promoting the sharing of opinions and encouraging employees to help one another. Fostering positive emotions depends on communication, informing employees about their performance, giving advice, and listening to their opinions. Promoting happiness in your business does not necessarily require money, but the determination to create a friendly atmosphere that increases creative thinking and openness to new ideas. Singapore has a global reputation for high quality education but do Singaporeans love to learn new things? The world is accelerating at a pace that has never been seen before and for SMEs to keep up it is essential to expand frontiers and transition into the digital economy. “Digital skills are in demand across industries as companies make a push towards digitalisation, automation and harvesting data,” said one business owner in Singapore. More SMEs are sending staff on courses ranging from cyber security, digital literacy, data analytics, and digital media to advanced manufacturing. “As SMEs globalise, cross-country operating skills are becoming more important and that means the ability to manage a diverse workforce, understanding international markets, and being open to new work experiences offered by new markets,” he added. Open-minded and inquisitive staff should be encouraged to learn new things to enable them to adapt to external changes in the world. Finding meaning in work may be more important than being happy in your job. Being happy and finding life meaningful overlap, but there are important differences. A recent survey by Stanford University revealed multiple predictors of happiness and meaningfulness. Satisfying one’s needs and wants increased happiness but was largely irrelevant to meaningfulness. Happiness is largely present oriented, whereas meaningfulness involves integrating past, present, and future. Thinking about future and past was associated with high meaningfulness but low happiness. Happiness is linked to being a taker rather than a giver, whereas meaningfulness goes with being a giver rather than a taker. Showing your staff that the work they do for you is valuable to your business and to you personally is good leadership. In general do you feel very positive about yourself? The ‘black dog’ of depression is a common ailment that may afflict an business owner who feels that they are drowning in issues that need to be resolved. Learning to be optimistic is key for business leaders. One recent study of four ASEAN countries on depression, anxiety and stress among workers found the positive mental health benefits of sleeping and negative mental health consequences of smoking. Business owners should advocate measures to reduce smoking and should also raise awareness of the positive benefits of increased sleep. Flexible working hours, pre-work group exercise, meditation rooms, mid-day walks, and stretch breaks are useful strategies. Create a holistic approach to improving workplace conditions to help your staff feel positive about themselves at work. Professor Martin Seligman is often referred to as the Father of Positive Psychology. From the US he turned traditional studies of psychology around from curing illnesses and negative psychological behaviour in to the study of authentic happiness and positive psychology in humans. He found that optimists perform better in all aspects of life than pessimists and that you can learn to be optimistic. Learned optimism can transform non-performers in to good performing staff and good performers in to great performers. Why don’t you try this out on yourself and your staff and build a team of optimists in your business and get ready to see better results. Resilience is challenging especially if you are at a low point in your life. Life often deals us unfair blows personally and professionally. As a business owner you may be hit by a change in the market or government regulations that you have no control over. A new tax may be introduced or another external factor that causes your business to dip or even crash. During the SARS epidemic in China many SMEs closed, especially those in logistics, as the whole economy froze for a certain period of time. How fast you adapt and recover may determine how successful your business will be. Finally there is ‘positive relationships’: People around you who really care about you. Ask yourself, ‘Who are the five people I spend most of my time with?’ and that will help you to reflect on who you are, at the moment, and who you need in your life and who you don’t. As a business owner this can help you to hire, reposition, develop and let go of staff. One strategy for marketing is to have loyal customers, people who keep coming back to buy your products and services because they have an emotional bond with your business. Maintaining positive relationships with long-term customers and suppliers involves communication and respect. Combining all the above ‘features’ that enable you and your business to flourish can help you become more effective as an leader and manager. Start by defining each feature in your own business context, then assess where you are right now, where you want to get to and then devise and implement strategies for moving each feature upwards to the desired level in your business, and keep them there. It shouldn’t take much time and a little effort will get you going in a better direction.